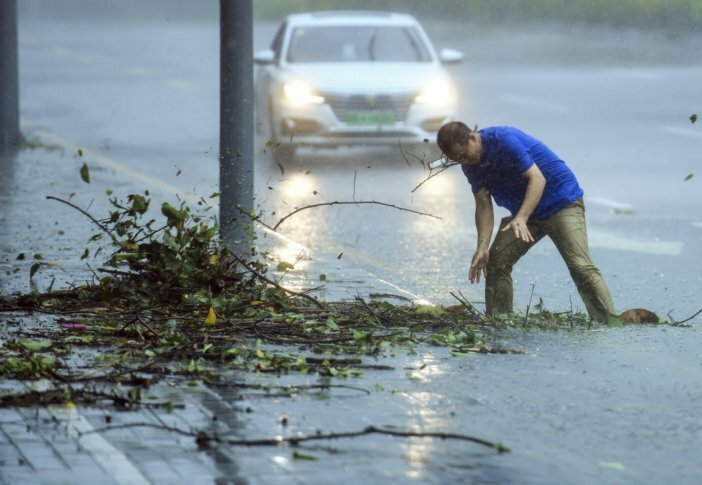 The storm was still affecting southern China’s coast and the provinces of Guangdong, Guangxi and Hainan and rain and strong winds were expected to continue through Tuesday. Hong Kong residents were told to stay away from the coastline and be on alert for occasional gales. Bus, ferry and rail services were suspended and almost 900 flights were canceled at the city’s airport, one of the world’s busiest. The South China Morning Post said Hong Kong’s hospitals had to use backup power due to outages caused by the storm. Mangkhut earlier lashed the Philippines, sparking landslides and building collapses that killed at least 65 people, with another 43 missing. Authorities reported four deaths from falling trees and building materials in Guangdong, China’s manufacturing hub. More than 2.4 million people had been evacuated in southern China’s Guangdong province by Sunday evening to flee the typhoon, state media said. “Prepare for the worst,” Hong Kong Security Minister John Lee Ka-chiu urged residents. That warning followed Mangkhut’s devastating march through the northern Philippines on Saturday with sustained winds of 205 kilometers (127 miles) per hour. Landslides caused by the pounding storm hit two villages in Itogon town in the mountain province of Benguet. “They thought they were really safe there,” the mayor said Sunday. He expressed sadness that the villagers, many of them poor, had few options to survive in a region where big corporations have profited immensely from gold mines.